It’s a big big world. We all know that – or we’ve heard that. Seeing the maps below, you may go from feeling how this world is so similar to how it is so varied & how intriguing it is. How the world drives – after the street view map above, here’s a world map displaying the driving orientation – right side outweighs left side driving by a huge huge margin. Bon voyage – just a fun fact, the longest straight line travel you can do on this planet is from Pakistan to Russia as shown by the map below. Originally posted here, for those of you wanting to see the straight line, here’s a quick video made by another redditor. The english have landed – A report published by Telegraph said that British have invaded all but 22 countries in its history. 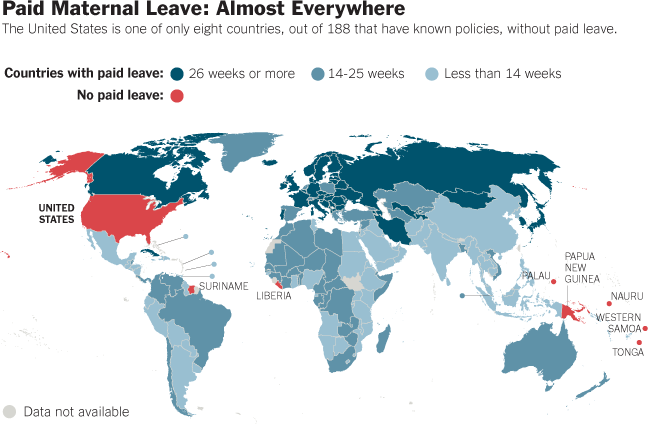 Mommy prepping – The map below shows the paid maternal leave policies – across the world. Although other factors like industry, organization too play a role in defining the exact duration. Kids are slipping on ice – what would you do? Sit back & make a video, right? BRACE YOURSELF – The father of all invention is here.